Today’s New York Times tries its hand at explaining why on earth something as silly as neighborhood public schools could bedevil Rahm Emanuel right out of his incumbent throne as Mayor of Chicago. My home is on Chicago’s South Side, on a street full of cops and firefighters. People say they’re “new to the neighborhood” if they’ve been here less than 25 years. With a decade under my belt in this city, I’m a relative newcomer. But traveling often for work, and seeing the gap between national coverage and reality on the ground, I’d like to try to answer a question that’s been posed often as of late: What happened to Rahm? Closing six mental health clinics in many of the same low-income neighborhoods affected by school closings. There was no rationale offered for this action, which even according to Rahm’s dicey numbers saved *maybe* $2.2 million (roughly what was spent on the failed Chicago Fire Festival). In comparison, Rahm raised $30 million for his campaign committee and a super PAC ahead of the February 2015 runoff. Reducing staff and hours at our public libraries, which only account for 3% of the city budget. Privatizing the CTA fare system and allowing companies like Mastercard to profit off of hidden fees. Additionally, the rollout of this “new, efficient, market-driven” intervention was a total disaster, while the Chicago card it replaced had basically been working just fine for years. These are not abstract policy decisions. If you live in Chicago, your library is open less. They have fewer librarians. There are fewer lifeguards on our beaches in the summer. You spent hours on the phone trying to activate your ventra card only to be disconnected. These are petty and mean ways to close a budget gap in the City of Big Shoulders. AND THEN THERE ARE THE SCHOOL CLOSINGS. Rahm: We have to make tough decisions because of our fiscal crisis. NYT: For the mayor, this was one step toward bringing better education to students trapped in failing schools amid a fiscal crisis. Chicago: In reality, CPS used accounting tricks throughout the entire process to hide the true (financial) cost of closing schools and overstate the benefits. These tricks have not been subtle, and WBEZ and Catalyst Chicago did an excellent job chronicling them. But it just takes too long to explain, and “BUDGET SHORTFALL THEREFORE SCHOOL CLOSINGS” is a convenient narrative, even when proven false. In fact CPS routinely releases estimates of huge budget deficits and still closes the fiscal year with a surplus: from 2005–2012, their budgets projected losses of $1.027 billion, but actually achieved a surplus of .92 billion — a difference of 1.9 billion. As good teachers and students know, doing your homework makes the difference. Rahm: These schools were “underutilized” due to declining enrollment. NYT: The population in Chicago had shrunk over time, some students had chosen alternatives like charter schools, and Overton was only half full. Chicago: Rahm and Co. used MANY lies on this one! Early press releases screamed about a loss of “145,000 kids in the city between 2000 and 2010, an 18 percent decline”. In reality, only 32,000 of those students were in the public school system. The “utilization formula” that CPS employed to determine which schools were “empty” was flawed for many reasons: it was based on a maximum for classrooms (36 students) rather than an optimal size (30). It did not take into account special education students, which accounted for up to 30% of some closed campuses. Parent group Raise Your Hand Chicago has meticulously documented the overcrowding in CPS elementary schools, which affects approximately 75% of schools at at least one grade level. Overall enrollment in Chicago Public Schools has declined 6 percent in the last 14 years, a loss of 28,289 students. In that time, CPS has opened more than 120 new schools, many of them charters, shifting enrollment patterns. The percentage of students attending traditional schools has dropped 17 percent, while the percentage in charter schools (most housed in non-CPS buildings) has increased. School officials say they have not analyzed whether opening new schools has exacerbated the number of empty desks in Chicago. The district has said it wants to open at least 17 more new schools this fall. Rahm: We had to do this to improve student achievement. NYT: A study by the University of Chicago Consortium on Chicago School Research found that 93 percent of the nearly 11,000 displaced elementary students wound up in schools with better ratings. According to the same research, only 21% of displaced students ended in Level 1 schools (the city’s highest tier), and CSSR research on closings has shown that only students in a substantially-higher performing school are likely to see improvement. More than 30% of students remained in Level 3 schools (the lowest rating), regardless of whether their numeric score was a point or two higher than the previous. In fact, the biggest takeaway from the CCSR’s 2009 study of more than 40 CPS school closings over the previous decade was that closing schools had little impact on achievement. NYT: In these neighborhoods, parents speak of deep ties to their old schools and frustration at having to move their children, sometimes to schools farther away or across gang boundaries. For many families academic quality meant something different than a schools’ performance policy rating. The way that many parents defined academic quality was different than the official markers of quality represented by the district’s performance policy rating system. For example, many families defined academic quality as having after-school programs, certain curricula and courses, small class sizes, positive and welcoming school environments, and/or one-on-one attention from teachers in classes. Of course, what do they know? Actually, apparently the exact same thing that the Consortium on Chicago School Research discovered: that test scores aren’t everything. Rahm: This is not about race. NYT: And many of the neighborhoods that faced schools closings were in predominantly black or Latino areas. Chicago: Uh, that’s a bit of an understatement. As it turns out, of 46,000 students impacted by school closures (not 30,000, as CPS tried to suggest), 88% were black, 10% were Latino, and .7% were white. So yes, predominantly. When 98% of the students affected are black and Latino, it is about race. Rahm: I definitely, totally, care about the people of Chicago. Chicago: It was especially touching how the mayor decided to let this news go public while on a ski trip with his family. 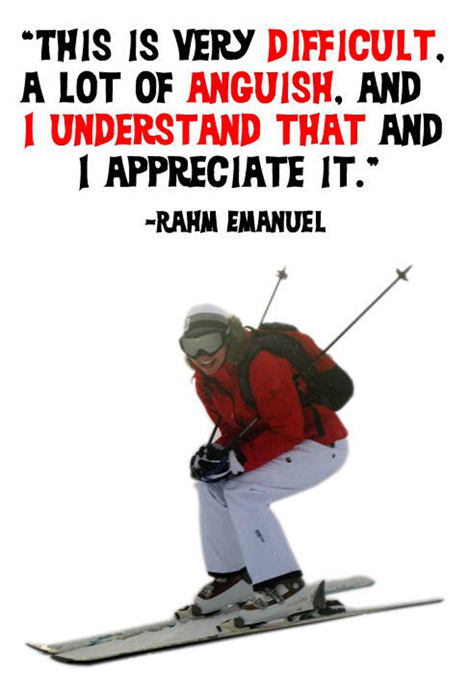 Not only could you have done things differently, Rahm, you could have asked the authentic leader’s question. The one that escaped you then and haunts you now: Is suddenly closing fifty neighborhood schools the right thing to do, and how will it affect the people of Chicago? In short, at some point the expansive gap between press conference sound bites and reality becomes too glaring to ignore, even for the democracy-squeamish denizens of our beautiful, corrupt home on a frozen lake. Repeating lies and half-truths doesn’t make them true. The people of Chicago and their lived experiences are an inconvenient truth, and even if the rest of the press forgets the little indignities and lies, we haven’t. See you in April, Mr. Mayor. This piece was reprinted by EmpathyEducates with permission or license. We thank the Author, Maria Moser for her kindness, observations, research and what we believe is a vital reflection.